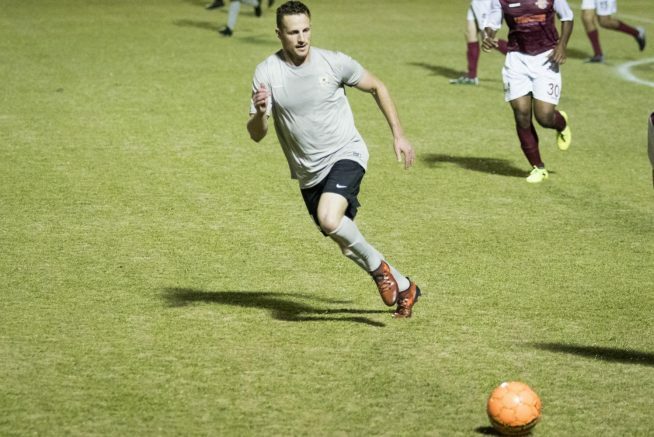 On Feb. 10, American River College hosted a friendly between USL team Sacramento Republic FC and NPSL team Sacramento Gold FC, during which the Republic came out on top 2-1. The Republic was lead by head coach Simon Elliot, clad in grey and black, while the Sacramento Gold repped the burgundy and white. The ARC women’s soccer team was there, conducting a 50/50 raffle, raising money for their team,all proceeds went to buy new gear and equipment. The first yellow card, a cautionary warning for harmful play, was given to Republic player Jaime Villarreal, in the 10th minute. Republic defender Hayden Partain, took a free kick just outside the 18-yard box, lobbing it towards Republic defender Mitchell Taintor. Taintor headed the ball dropping it to midfielder Villyan Bijev, who then scored the opening goal in the 15th minute. Sac Gold player Kaba Alkebulan was presented with a yellow card in the 26th minute, resulting in a free kick for the Republic. Another yellow was shown 11 minutes later to Gold player Gabe Padilla. The Republic carried their 1-0 lead into halftime. The idea for the costume originated “…like any good story it begins with a dead lion,” Gibson said. According to Gibson he dressed as Cecil the Lion a few years ago for halloween. Soon after he decked the costume out with flashing lights before eventually realizing that it could double as a bear costume to wear at Republic games. That was two years ago and Rave Bear has been a staple in the Battalion ever since. The supporter group means something different for everyone and for Gibson it means having a feeling of kinship with others. “It’s having a community and supporter culture of diverse soccer fans in my area,” Gibson said. When the second half began Republic had subbed out all eleven players. In the 57th minute, Sac Gold forward Kaba Alkebulan snuck past the Republic defense and scored the equalizing goal on keeper Rafael Diaz. Minutes later,Sac Gold player Steven Wright was shown a red card, a straight ejection from the game, for foul that denied the Republic a goal scoring opportunity. Sac Gold was then forced to play the remainder of the game with 10 men, instead of the usual 11. Because of that foul call, Republic was presented with a free kick right outside the 18-yard box, which was missed, the game then restarted with a goal kick by Sac Gold. The Republic were able to regain the lead with one last goal in the 86th minute, scored by midfielder Keven Aleman. Sac Gold made one last ditch effort to regain an even score in extra time, but Republic keeper Rafael Diaz was able to make the save, sealing the win for the Republic 2-1. Republic trialist Kamron Crow said that there are things the team has to work on, but they know what their strengths are. Both the Republic and the Sacramento Gold’s official season starts Sat. March 17. Be the first to comment on "Republic beat Sac Gold in friendly hosted at ARC"